If you’re a golfer who loves to walk and carry your golf bag around the golf course, it’s essential that your stand bag or carry bag is a high-quality one. The last thing you want to deal with is a golf bag with uncomfortable carry straps, too much weight, and legs that aren’t reliable. The best golf stand and carry bags provide a comfortable and reliable way to carry your golf clubs for 18 holes or more. Below, you will find our favorite Golf Stand Bags and Golf Carry Bags, along with the information you need to make a well-informed decision. The trademark of a great golf stand bag is that it’s lightweight, and this is one of many reasons the TaylorMade Flextech Lite makes the top of our list. At just over 4 pounds, you can carry all 14 clubs comfortably. Combined with the dual density comfort straps and full-length dividers that avoid crowding, the TaylorMade Flextech Lite be the best stand bag you’ve ever used! Umbrella sleeve and water bottle holder makes it easy to carry everything you need for a round of golf. Designed specifically to keep your clubs divided and easily accessible. Ergonomic hip pad improves comfort while you carry your clubs. Can be difficult to carry alignment sticks or other golf accessories. Not suitable for being strapped in a golf cart. One of the most unique features for this golf stand bag is its 14 individual dividers, which is something you typically find in cart bags. This stand bag also includes a putter and driver well for easy placement and removal, and at only 5.2 pounds, it’s hard to beat this incredible golf stand bag. Six pockets make it easy to keep all your golf accessories organized. The stand legs are lockable and keep them safer from damage. One of the few stand bags that sits well in a golf cart. Not as light as some other golf stand and carry bags. Grip at the top not as useful as it’s designed to be. 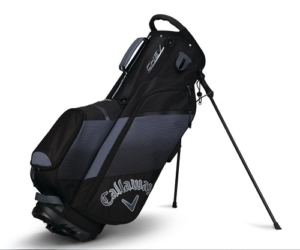 You will be the most stylish golfer on the course with this great golf stand bag from Callaway. Featuring a wide variety of eclectic colors, the Chev Stand Bag is as attractive as it is effective. Combined with comfortable straps, a full-length apparel pocket, and an easy grab handle at the top, this stand bag features everything you need to play your best golf. The velour-lined valuables pocket is water resistant and ideal for keeping your phone and wallet secure. 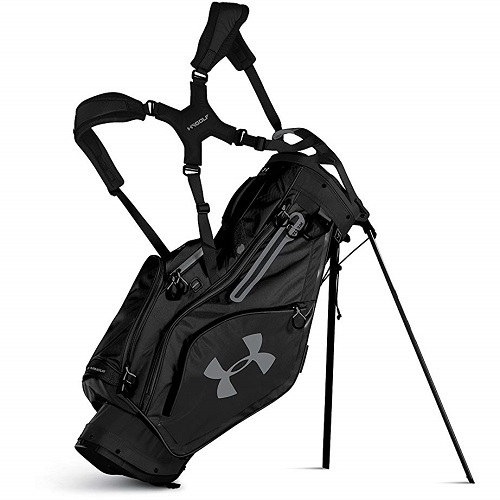 At only 5 lbs., this golf bag is extremely lightweight and easy to carry. Full-length dividers make it easy to keep your clubs organized. Not an ideal golf bag for those who prefer simplistic designs and colors. Straps can be a little tedious to adjust. 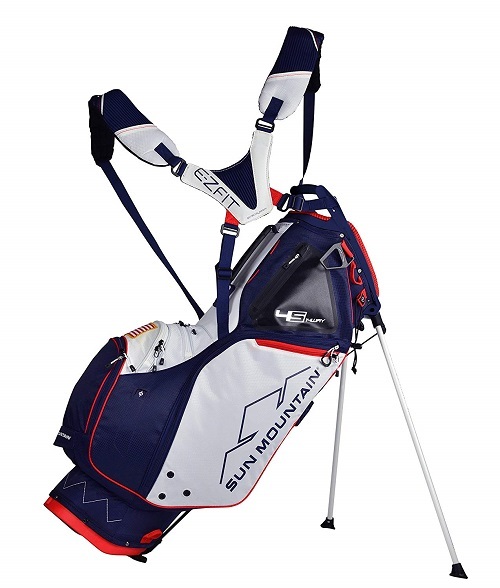 Sun Mountain has been one of the biggest names in golf bag manufacturers, their latest model is one of the best stand golf bags in 2019. Featuring 14 clubs worth of full dividers that keep your clubs separate, and a whopping 9 different pockets to store your extra gear, you will get your money’s worth with this awesome stand bag. One of the few golf stand bags that offers lumbar support. The E-Z Fit Dual Strap System makes it easy to place and remove on your shoulders. The legs are both incredibly stable and lightweight. Priced on the higher end of the golf stand bag market. Putters with large grips can be difficult to replace and remove in the bag. 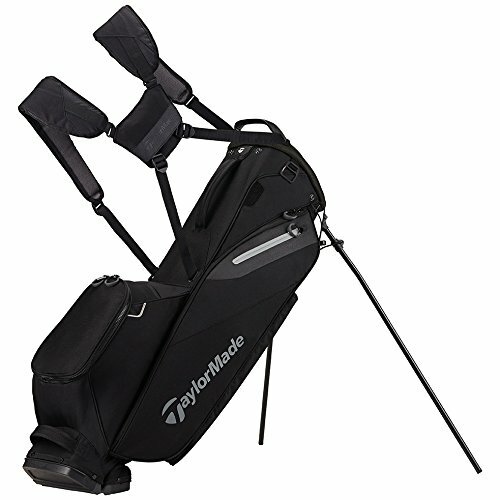 With 5 dividers and 6 pockets, this lightweight stand bag from TaylorMade provides one of the best walking experiences on the golf course. 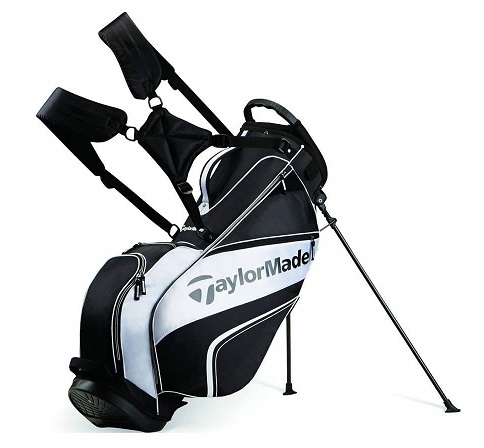 People who love and trust the TaylorMade brand will love adding their golf clubs to this golf bag. Dual straps provide security and comfort while walking along all types of terrain. Beverage holder allows you to stay hydrated throughout the round. Top handle makes it easy to remove clubs from the trunk. Limited amount of different colors. Less dividers can make it difficult to keep clubs from clumping together. One of the biggest names in sports apparel teamed up with Sun Mountain to produce this amazing golf stand bag. At only 5 pounds, the Storm Match Play is strong enough to hold all your golf clubs and light enough to remain comfortable for 18 holes or more! Ventilated and ergonomically-designed for comfortable carrying in all weather conditions. The Under Armour logo is appealing to those who love the brand. Sits easily in a golf cart well. Not suitable for pull or push carts. The price may be too steep for the average golfer. The smallest and lightest of the Callaway Golf Stand Bags, the Hyper Lite features a cell phone sleeve, a zippered valuables pocket, and a full-length apparel pouch for your rain jacket. 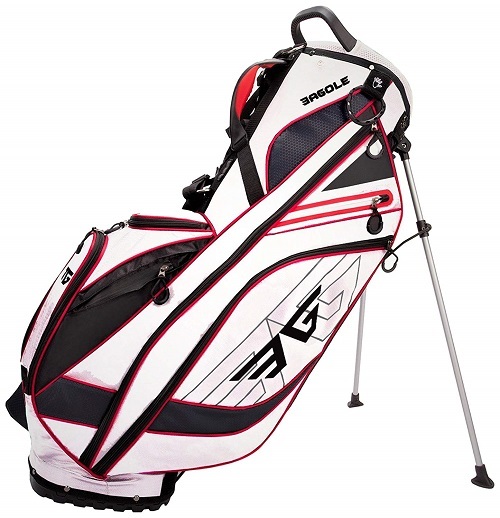 Available in dual- and single-strap, this carry bag is great for playing golf and practice. Available in several cool colors. Light and sturdy carbon fiber legs keeps the bag up even during practice. Plenty of room for up to 14 clubs. Can be difficult to retrieve clubs when full. Nylon fabric is prone to wear and tear. 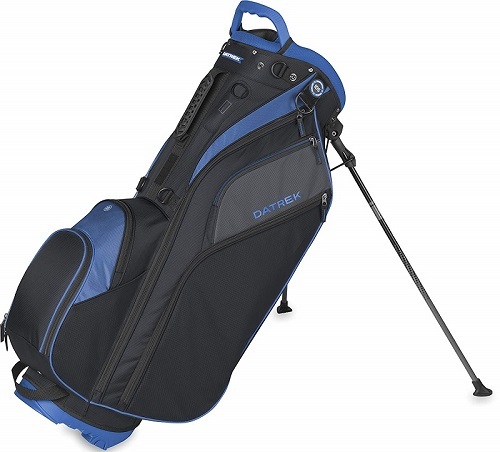 This very lightweight golf bag is one of the most affordable stand bags in our top 10. This golf bag features a smart strap design to maximize the center-of-gravity placement for more stability while carrying, plus plenty of pockets and convenient molded grab handles. The 4-way top dividers make it easy to organize your woods, irons, wedges, and putter. Straps are easily adjustable for golfers of all sizes. Includes Golf Glove and Towel Clip for easy access. Smaller top opening makes it tough to fit all 14 clubs, especially clubs with bigger grips. Not much selection in colors. 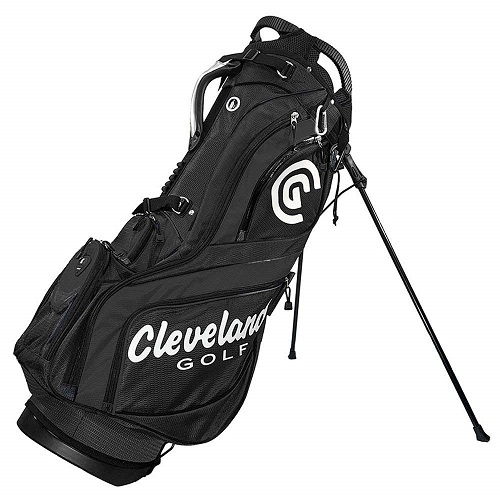 The Cleveland Golf brand has been making high-quality stand bags for years, and the CG Stand Bag is no different. Featuring 14-club dividers and comfortable straps, this bag also includes a pen holder, a tee holder, and a fleece-lined valuables pouch. Plenty of space for all your clubs, even those with oversized grips. Perfect for the golfer who plays tournaments and needs to keep their accessories organized. Center handle makes for easy lifting. Not recommended for loading into a golf cart. Only comes in black/white and red/white/blue. Rounding out our top 10 list is the trusted name of Izzo. 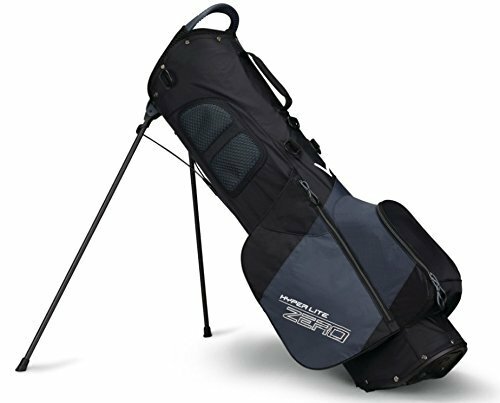 Their Versa Golf Stand Bag features a hybrid design, making this the ideal stand bag for the range, the course, or on a golf cart. You can even keep your GPS or smartphone charged thanks to the portable charger. Perfect for the golfer who walks and rides on the golf course often. The insulator cooler pocket keeps your drinks and snacks colder on those hot days. The 11-way divider can make it tough to fit all 14 clubs. Much heavier compared to other golf stand bags. We hope this list gives you an idea about the best golf stand bags on the market today. Golfers who love to walk with their clubs and are looking for the lightest bag they can find will love every bag on our list. 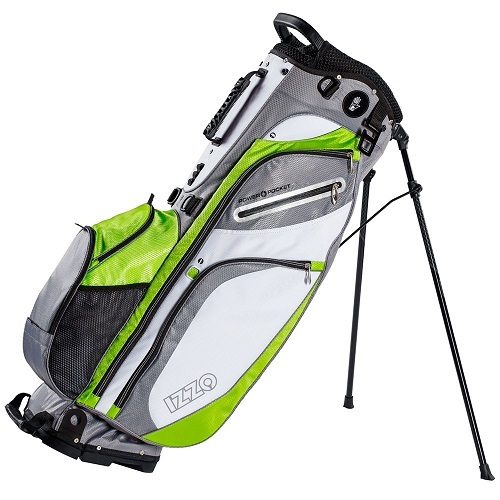 For those in need of a bag that also works on a golf cart, the Go Lite Hybrid and Izzo Versa Hybrid are excellent choices. If there is a golf bag on the list you love, click on the appropriate links and buy your next great golf stand bag today!